Source : Smartphones have huge amounts of RAM and processing power nowadays, what with the octa-core processors and 4 gigs of RAM. Having all that processing and graphics power in your pocket without actually utilizing it, would be an injustice to your smartphone. However, you can remedy that by playing some amazing games on your Android smartphone or iPhone / iPad, and one such game is Doodle Army 2 : Mini Militia a.k.a DA2. It’s an intense multiplayer combat game, which has gotten a lot of praise off late for its addictive multiplayer gameplay and great graphics. Well, if you are looking for more such games, we are here to your rescue. Shadow Fight 2, developed by NEKKI is a game that has gotten some major upgrades since its release. With a number of updates, NEKKI has managed to take this game to another level. The graphics are amazing, and it doesn’t feel anything less than playing a game on a console. This action RPG game lets the player develop fighting skills as they progress on to next levels, opening new chapters, weapons, fighting abilities and magic skills. The latest update has been one of the most awaited updates of all times, as it brings a new mode that lets you team up with players online and fight against the mightiest titans. The winner is decided by comparing the damage points, and the winner gets a prize that will assist him/her in their later quest. Definitely worth checking out, right? If you’ve ever been a retro gamer and played “Nox-Type” in the past, then you know how it feels to fly and shoot in a deadly jet. Did you often find yourself arguing with your friends about who the better pilot is? Well, here’s your chance now, as Dual, developed by Seabaa brings across the same vibe as “Nox-Type”. The game lets you connect to a local network or Bluetooth for some one-on-one action just like in the classic times of retro consoles. It lets you compete with one another and helps you finally decide who is the better pilot. The graphics are like advanced retro, exactly what you’ll expect to see in a retro game on a modern device. One of the most downloaded games on smartphones when it comes to multiplayer racing games, Asphalt 8: Airborne is most famous for its smooth gameplay and high-resolution graphics that lessen the gap between gaming consoles and smartphones every day. Gameloft, the company behind the game, is a success story in the mobile gaming world. The game has received a perfect score from so many game critics around the world and rightly so, as it offers explosive racing action, where you get to choose from a large number of customizable racing cars. You can unlock more cars and customize them according to your needs. Also, like Mini Militia, Asphalt 8 offers real time multiplayer racing with up to 12 players. Another huge success developed by “Gameloft”, Modern Combat 5 is a multiplayer first-person shooting game that lets you team up with your friends and test your skills against the players from around the world. The FPS and graphics simply put are just amazing. The game offers gameplay similar to “Call of Duty” and “Battlefield”, where you are put into a heated battle zone. You can customize your soldier and choose your weapons to suit your playing style. You can also use explosive weapons to wreak havoc on your enemies and win the battle for your team. An online multiple player strategic game developed by “Supercell” is one of the most played strategy games online, thanks to the game being available for all major mobile platforms. The game lets players collect coins, develop armies, build castles, attack enemies, and much more. The player must fight other clans online for the survival and development of their clan. The player must also develop a raid strategy using his/her army to break the enemy walls and loot as much as possible. In a similar way, the player must develop their clan to have one of the strongest defense lines to avoid raiders and risk losing resources. Words with friends is a very challenging and exciting spelling bee contestbetween friends. Words with friends, developed by one of the most well known cross-platform game developers “Zynga”, is a top word-making game for phones. The game is available in quite a number of languages besides English, so you can still play the game if English is not your language. The game lets friends challenge each other at word making competitions online. The game also lets you chat with your friends and offers a single player mode for you to practice and improve your word building skills. Your friends and you won’t even notice the time slipping by once you start playing this addictive game. Developed by Miniclip for all major browsers and smartphones, the game connects millions of players to compete for the prize in a game of pool. 8-Ball features live online gameplay, which means that you don’t have to wait for the other player and it all happens in real time. The game has gained major success around the globe, all thanks to various real time online tournaments and a simple friends mode. If you know how to take perfect shots, you can dominate the table at all times. You don’t have to wait for tables in a club to play a round of 8-Ball with your friends; now you can do it from the comfort of your bed or couch. Badland is one of the most popular adventure games in the gaming world. A huge hit for the developers, “frogmind”, Badland is an adventure game where the player controls the avatar or multiple avatars to move around some very challenging terrains. You have to solve puzzles, navigate through complex areas, and beat the timer to enjoy this game. Badland has some great visuals and the game also features an offline multiplayer mode that allows up to 4 players to play at a time on a single device. So, if your squad needs to kill some extra time, this is the game you should be playing with your mates. BombSquad is a really fun and exciting multiplayer action game a group of friends can play. Up to 6 players can play online and 10 on a local network. The gameplay has some very realistic game physics, and there are multiple mini-games ranging from explosive hockey to capture the flag, where you can go head-to-head with your friends. You can either play free-for-all where everyone is on their own or choose team-mode to play with your friends. This game is a must try for a group of friends who want some epic time together. Fruit Ninja developed by “Halfbrick Studios” features multiple gameplay modes like Zen Mode and the all new Ghost mode. The Game features a Dojo, where the player must train to become a true fruit ninja. A player must learn to quickly distinguish between fruits and bombs while honing their reflexes. You get to slash and slice different fruits with the swipe of a finger while dodging the incoming bombs to score points. The game also features an offline multiplayer option,where players can go head to head against each other in a quest to score more point than their rivals. The game is updated frequently featuring new dojos, more swords, and new exciting features, so you must check it out. Ready Steady Bang is a game, which must be played together with your friends. Developed by Noodlecake Studios, the game features multiple gameplay modes, one of which is the exciting multiplayer mode. The game offers classic wild west battles where you can settle grudges in one-on-one shootouts and make Clint Eastwood proud. The offline multiplayer mode uses split screens to enable both players to play on the same device. Robotek is a strategic multiplayer game, based on robots and how robots would be the new world order once humanity has been completely wiped out. Now, the player must choose sides, develop abilities, and skills that will help them win and take over the entire planet, one node at a time. Robotek is developed by one of the most well known game developers “Hexage” and features about 200 levels and special abilities that include the devastating nuke that will wipe out entire world. An arcade multiplayer game where you must prove your strategies and courage to win the war. Shadowgun is developed by “MADfinger games” and powered by “Unity3D”, which makes sure the game packs in excellent graphics. Shadowgun features a very interesting gameplay, similar to the Gears of War series on the Xbox consoles. The sci-fi shooting game has a very interesting storyline in the single-player mode that will keep you hooked for a long time. You get to team-up with your friends and engage in firefights to defend your territory against intruders. It is also a cross-platform title so you can play across different platforms online. World of Tanks Blitz takes you to the World War II times, where you must wreak havoc to win against other online players. 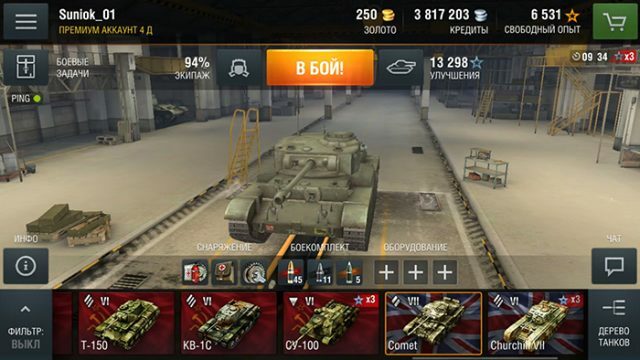 The game has received more than 550 thousand downloads and has been a success for “wargaming group”. The game lets you modify your tank’s abilities, firepower, and looks, to suit your taste. Get ready to blast your opponents into tiny bits and pieces with your heavily armored tank. You can also add cute tattoos to your tank, which is a funny aspect for a death machine that causes havoc.